One of our favourite finds of last year was Rushmere Country Park near Leighton Buzzard. It's a really great, family orientated park. 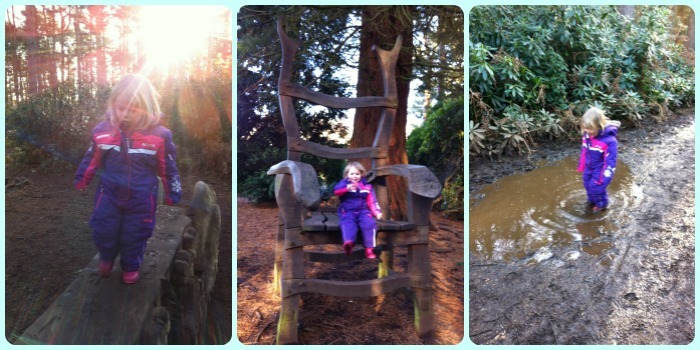 On New Year's Eve, we wanted to get outdoors for a couple of hours so headed off to the Park. Little Miss A loved finding all the fairy doors on previous visits (you can read more about our first visit to Rushmere County Park). We decided to visit again as I'd seen that they had a Fairy Trail running over the Christmas period. We collected a Trail sheet from the Visitors Centre which cost £2 but you got a fun Christmas pencil to use and keep! 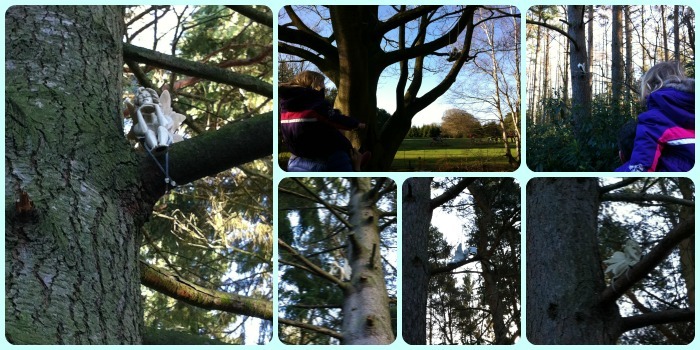 There were 5 fairies hidden in the trees to find (there were meant to be 6 but unfortunately one had gone missing). They were lovely statues and some you needed a really good eye to spot, but once Little Miss A knew what she was looking for then she enjoyed finding them. Once we'd spotted all the fairies, we just took a general wander. Little Miss A kept finding the biggest muddy puddles to go through! 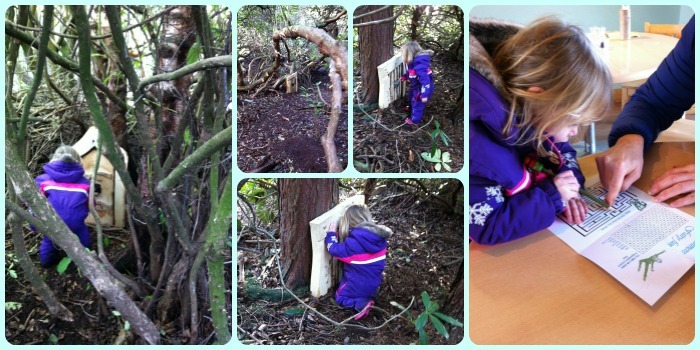 On the way back to the cafe and playground, Little Miss A found lots of the fairy doors. There have been some new doors added since our last visit. The walk was just what we needed to blow the cobwebs away. I'm sure there will be more visits to this great park in 2016. It's worth keeping an eye out on the Rushmere Country Park Facebook page for future events. I am a volunteer with the Greensand Trust who manage and part own Rushmere Country Park, so it is good to hear that the efforts of the staff and many volunteers, are appreciated. As a conservation charity we are always trying to find ways to present the countryside to the public, especially ones like little Miss A, in the hope that she will follow in our muddy footsteps, and appreciate and conserve our beautiful surroundings. I hope we will see you soon, and don't forget to come to see the Heron when they return in February, (fingers crossed that they do!). Thanks so much Stan. All the efforts of the staff and volunteers are definitely appreciated. We're so glad we found this Park and will be returning again soon I'm sure - hopefully for the Heron! Thanks Cheryl. Geocaching is on our list of things to try out. Must do some more research to understand it! It is one of our favourite finds from last year. We love going there. What a lovely park, the fairy doors are such a great idea! The doors are lovely and it's nice that they keep adding to them. They're all different. That's a good idea with the chocolate coins Becky! Must remember that one! Fairies always seem to capture children's imaginations so things like fairy doors and trails are great! What a great trail and they've gone to so much detail - I know mine would love seeing the fairy doors in the trees. It is always good to get out and blow away the cobwebs, no matter what time of year! Definitely! We get out and about come rain or shine. If you visit these kinds of places in the winter then they're a lot quieter with less people around. It's great to capture kids' imaginations in the woods with tales of fairies and things! I know. LO always rushes over to climb up on the big chair! It's always a big hit with all the kids in the Park. It looks like s fab day out and little Miss A is well prepared in her waterproofs. We love searching for things too, but haven't been anywhere where you find actual fairies! That must have been exciting. Love the photos on the muddy puddles! I know. The actual fairies were a lovely addition along with the fairy doors. Not sure how long they'll have them there but they were such pretty figures. Thanks Chloe and thanks for hosting #WhatevertheWeather. Fairies really capture children's imaginations. This looks like the perfect place to explore with little ones and get their imagination really working. Little Miss A looks thoroughly encapsulated by everything around her, It's a shame one of the fairies had gone missing but at least you could still search for the others. Thanks for linking up with me on #CountryKids. Thanks and thanks for hosting #CountryKids. It really is a great park. We always find something new when we visit.